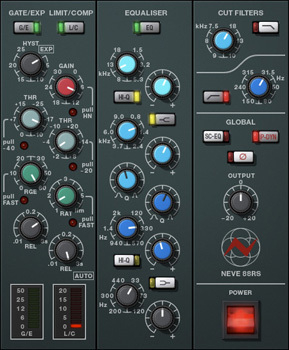 Neve 88RS Plug-In, Software channel strip from Universal Audio in the UAD Plug-In series. Perfection is what you get from Universal Audio, in the implementation as well as in the sound. In 2001, Neve launched the 88 Series: A new, large-format analog console that represented the best of all Neve designs that came before it. Considered the ultimate console for modern features and reliability, it is also heralded as one of the best-sounding consoles ever made by veterans of both the audio and film communities. The 88RS has found a home in some of the finest rooms and scoring stages around the world, including Ocean Way, Abbey Road, AIR, The Village, Sony Pictures, 20th Century Fox and Skywalker Sound. With a rich palette of modern sound-sculpting tools, the Neve 88RS Channel Strip captures the EQ and dynamics section from Neve's flagship console. The controls comprise 12 dB per octave high and low cut filters, a four-band EQ plus limiting, compression, gate and expansion. The middle EQ bands are fully parametric, while the flexible high and low bands provide the user with two fixed-Q types and the ability to switch to shelving EQ. The VCA-type Limit/Comp provides a 0.01 to 3s release, Auto Release and a continuously variable ratio control with a fixed fast or slow attack time. The Gate/Exp provides 0.01 to 3s release times, fast or slow attack times plus Threshold, Range and Hysteresis to tailor your gate or expansion effect to the perfect response for any source. Additionally, the user may engage the P-DYN button to reorder the signal chain so that the EQ is first. With the SC-EQ button, the user may engage a sidechain feature to achieve frequency-dependent compression for such use- ful tasks as de-essing. The UAD Neve 88RS controls are divided into four main sections: dynamics, EQ, cut filters, and global. Each section and control is detailed below. You can click-hold the power switch then drag it like a slider to quickly compare the enabled/disabled state. Robin Schneider's review (This content has been automatically translated from French)" A good overall tool"
He moved with all UAD2 plugins. Once the purchase is made and the authorization file updated, the plugin is used in the Apollo or insert your favorite DAW. The PDF manual is very detailed and provides all information needed to use it. I turned on a mac pro quad with UAD2 DUO PCIe card and a quad in the Apollo. It is a relatively undemanding plugin since we can put 48 stereo instances (Mono 70) on a UAD2 Duo. Usually it is enough to treat a whole mix. SSL ChannelStrip compared is 22 stereo instances of similar functions. 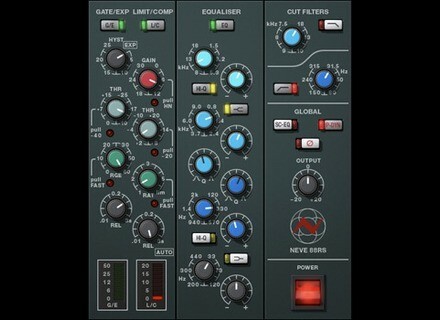 This plugin modeled filters, dynamics and EQ section of the Neve 88RS console. It is therefore in the Neve early 2000s, and the functions are comparable to 8801 rack. Warning, this plugin does nothing simulates the preamp or distortion amplification stages. Thus, this plugin has no impact on the sound as it does not deal with (unlike the Moog pultec, fairchild them that color even without treatment). It is clearly in the ChannelStrip plugin that simulates the analog level of ergonomics, temporal data, etc.. In practice this is a great channel strip to quickly process a source. I use it mostly on battery, noisegate works very well once you have learned to use the EQ is very pleasant to use. The main drawback of this plugin is that the screen is not accurate. In logic, if you change the presentation "controls" mode, where the parameters are listed without the interface, we realize this inaccuracy. Same for the EQ, you put a dent in 6K and in fact you're at 2.5 K.
So to settle mainly in the ear, and certainly not to the eye. Finally, the compressor does not have adjustable attack time (well, a normal mode and a fast mode) and is rather "uncompromising" genre. It can quickly crush the signal. Overall, I am very satisfied with this plugin, especially since I got to -40% in a promo AU. I have three Mac platforms diffrent which I turned the application. The slice works well, more thundering, it uses few resources compared to DSP tools Neve, effective but more intensive. I work with since June 2011, I used to work with slices, virtual or natural resources (SSL, In-voice, Sonnox, Neve, ..) to your exact it is trs trs closer to the original, not better than the others but a different grain, I use it for rhythmic bases (drums, basses, guitars, keyboards) and trs is good.